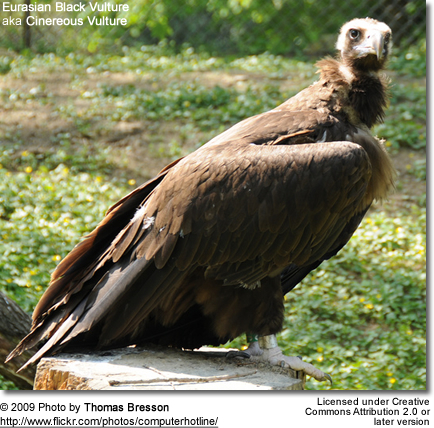 The Eurasian Black Vulture (Aegypius monachus) is also known as the Black Vulture, Monk Vulture, or Cinereous Vulture. It is a member of the family Accipitridae, which also includes many other diurnal raptors such as kites, buzzards and harriers. This bird is an Old World vulture, and is only distantly related to the New World vultures, which are in a separate family, Cathartidae, of the order Ciconiiformes. It is therefore not directly related to the American Black Vulture despite the similar name and coloration. 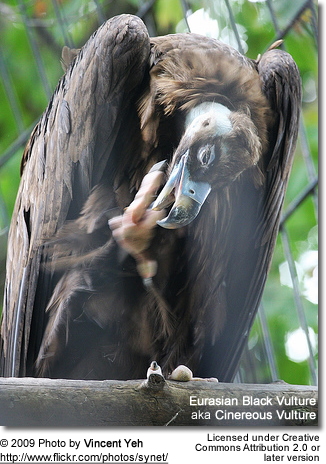 The Cinereous Vulture is perhaps the largest birds of prey in the world, though nearly equalled by the Himalayan Griffon Vulture. The Andean Condor, slightly larger, is now generally considered unrelated to the true Falconiformes. This huge bird is 98–120 cm (39-47 in) long with a 250–300 cm (99-119 in) wingspan and a weight of 7–14 kg (15.5-31 lbs), and is thus one of the world's heaviest flying birds. It has all dark blackish-brown plumage, and even at a distance can be distinguished from the Griffon Vulture by its evenly broad "barn door" wings. 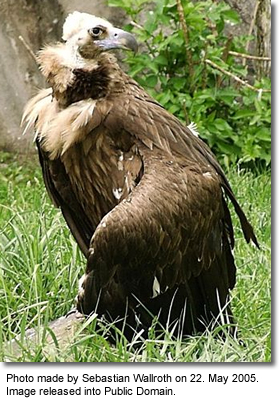 It has the typical vulture unfeathered bald head (actually covered in fine down), and dark markings around the eye give it a menacing skull-like appearance. The beak is brown, with a blue-grey cere, and the legs and feet are grey. It is on average larger than mostly sympatric Griffon Vulture. 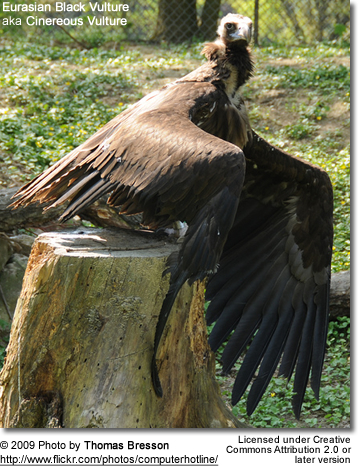 Among the vultures in its range, the Eurasian Black Vulture is best equipped to tear open tough carcass skins, using its powerful bill. It is dominant over other vultures at carcasses. It can fly at a very high altitude. It has a specialised haemoglobin alphaD subunit of high oxygen affinity which makes it possible to take up oxygen efficiently despite the low partial pressure in the upper troposphere. It breeds across southern Europe and Asia from Spain to Korea, but is endangered throughout its European range. It is resident except in those parts of its range where hard winters cause limited movement. It breeds in high mountains and large forests, nesting in trees or occasionally on cliff ledges. The Cinereous Vulture has declined over most of its range in the last 200 years due to poisoning by eating poisoned bait put out to kill dogs and other predators, and to higher hygiene standards reducing the amount of available carrion; it is currently listed as near threatened. The decline has been the greatest in the western half of the range, with extinction in many European countries (Portugal, France, Italy, Austria, Poland, Slovakia, Romania) and northwest Africa (Morocco, Algeria). More recently, protection and deliberate feeding schemes have allowed some local recoveries in numbers, particularly in Spain, where numbers increased to about 1,000 pairs by 1992 after an earlier decline to 200 pairs in 1970. Elsewhere in Europe, very small but increasing numbers breed in Bulgaria and Greece, and a re-introduction scheme is under way in France. Trends in the small populations in Ukraine (Crimea) and European Russia, and in Asian populations, are not well recorded. In the former USSR, it is still threatened by illegal capture for zoos, and in Tibet by rodenticides. The genus name Aegypius is a Greek word (αιγυπιος) for 'vulture', or a bird not unlike one; Aelian describes the aegypius as "halfway between a vulture (gyps) and an eagle". Some authorities think this a good description of a lammergeier; others do not. Aegypius is the eponym of the species, whatever it was. The English name 'Black Vulture' refers to the plumage colour, while 'Monk Vulture', a direct translation of its German name Mönchsgeier, refers to the bald head and ruff of neck feathers like a monk's cowl. 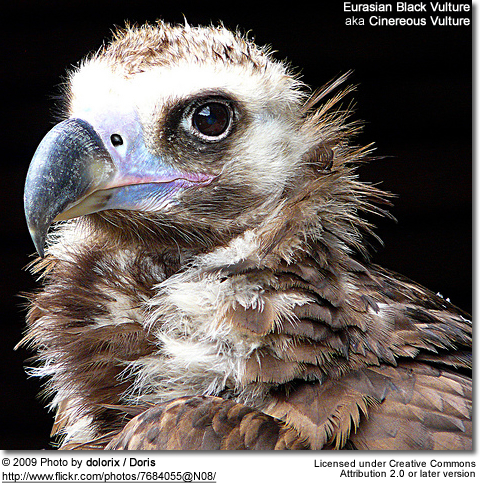 'Cinereous Vulture' (Latin cineraceus, ash-colored; pale, whitish grey), was a deliberate attempt to rename it with a new name distinct from the American Black Vulture.